The Streatham & Brixton Chess Blog: Every Picture Tells A Story: Will The Real Thomas Leeming Please Stand Up. Every Picture Tells A Story: Will The Real Thomas Leeming Please Stand Up. Blog 2 in a series of collaborative posts. This one by Martin Smith, with comment by Richard Tillett. This is the second episode of our search for the gentlemen of the Hereford Chess Club, painted by one Thomas Leeming in the early part of the 19th Century. You'll find a scan of a reproduction of his painting in our first post. The picture was used by historian of interior decoration, Professor Mario Praz, to illustrate the taste of the period. 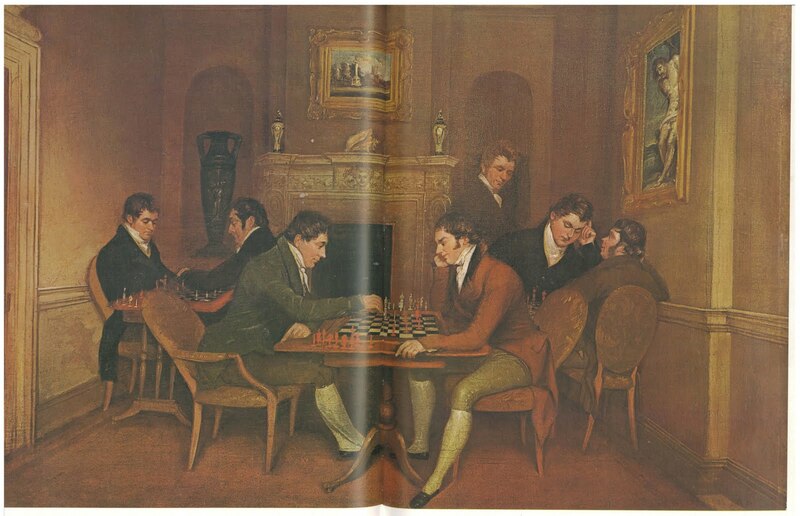 Praz also used another, rather better known chess picture by Johann Erdmann Hummel (you can even buy a "handmade oil painting reproduction" of it here). But that is enough of Herr Hummel, we'll return to him in a later post. One picture is quite enough to be getting on with. Our search for Thomas Leeming, and the gents he portrayed, starts with the leads in the picture's text box. Our thinking was simple: if Mr Greenlees and his collection were still in Florence we were home and dry. We quickly establish that, alas, he had died in 1988 after an eventful life, especially during WW2 in Italy, and he was a colleague and friend of Mario Praz. That too will have to wait for another time. What snippets we could find about the Ian Greenlees' collection suggest that it had been split up: bits bequeathed to friends, some eventually going to the local commune, some auctioned off; and we find a reference to a picture sold a few years after his death at Sotheby's in 1991. This could be worth following up. Multitasking, we also go in search of Thomas Leeming. We discover that several of his portrait miniatures have been sold at auction, and we get a promising internet hit to the Irish Arts Review. Tom Chivers, through his academic connections tracks down the article. It shows another of his pictures and describes him as "obscure", but then we knew that already. The article says that he flourished between 1811 and 1822, similar to the dates given for him in auction catalogues. And that seems to be all that is known about him. Reassured that we weren't the only ones who found him obscure, we'd gleaned that Leeming painted portrait miniatures and that some of his clients had been in Ireland. 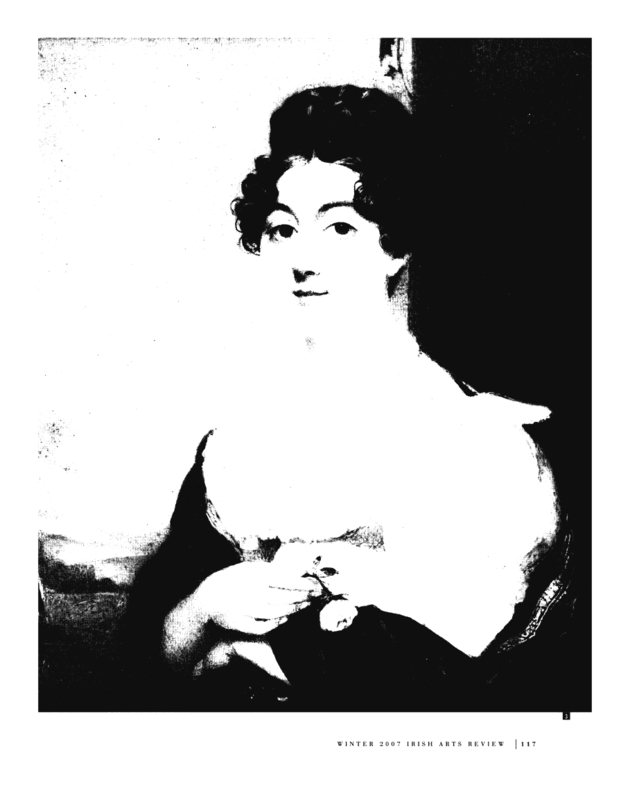 Possibly the daughter of the 4th Earl of Shannon. Irish Arts Review, Winter 2007. A miniature by Tom the Obscure. So was there an Irish connection? With that name - Leeming - yes, maybe. So we try the National Gallery of Ireland. Mr. Wynn Jones, after delays because of gallery renovations, eventually comes back to us, fantastically helpful. First off, he sends us an image of yet another unknown (to the chess-in-art world) chess painting (and that, too, must go on the blog's backburner). He says that Leeming isn't in the data base of Irish artists (that's one theory down); nor is he in the extensive Grove Dictionary of Art (now it's looking hopeless). However (and we aren't sure how he knows this), Mr. Wynn Jones says that Leeming was active in Hereford between 1800 and 1815. Not only that, he tells us that a painting by Leeming, Hereford Chess Club, is now in the Hereford City Museum and Art Gallery. Knock us down with a feather. How obvious is that. The picture had gone home. Off goes an email to the keeper of the Hereford art collection. Just in case you think we are obsessed, we'd better point out that all this was strung out over weeks, months, indeed, a couple of years: we have busy lives to lead, chess teams to run, and AGMs to attend. It wasn't always top of our, or our correspondents' To Do Lists. Between bouts of activity memory of the picture also becomes a little dim. 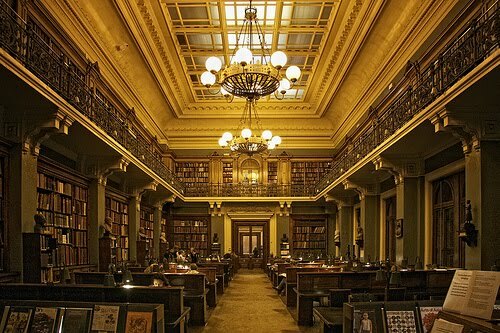 While we wait for a reply from Hereford I sign up to the very wonderful National Arts Library at the Victoria and Albert Museum - walls lined with books, panelled workstations with leather padding, and an invigilator on a raised dais to make sure you've not gone in for a quiet nap. It also has a complete set of auction catalogues. Another hit. There it is for the Sotheby's auction 10 July 1991: knocked down for £7,200. 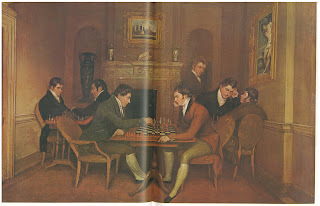 T. Leeming: Portraits of the Gentlemen of the Hereford Chess Society. We surmise that the picture was sold to the Hereford City Art Gallery. There's a small black and white reproduction. And there's more - all the sitters are identified. They are, from left to right, a Mr. Allen, Francis Louis Bodenham, the artist (yes, the artist himself has emerged from his anonymity), a Mr. Buckson, Edwin Goode Wright, Charles Biss, and Theophilus Lane. "How fitting!" he says, "Our Thomas Leeming was not only an artist but also a chess player". ...."he's standing watching the action". A moment of baffled silence as each concludes that the other must be having a senior moment. Then the pennies start to drop. The image in Praz must be the wrong way round - the book's printers have reversed it. It could be Sotheby's picture that is the wrong way round, though surely the artist would want to paint himself as observer rather than participant. The standing figure has to be our man. But we won't be certain until we hear from the lady at the Hereford City Art Gallery. And that's for next time...the 4th December. Christopher Wright et al, British and Irish Paintings in Public Collections (by artists born before 1870), New Haven; London; Yale U.P., 2006. We didn't know then, but we think we know now, that this is where Mr Wynn Jones spotted Leeming and the Gents of Hereford. Thanks again, to him. Paul Caffrey, The Shannon Collection, Irish Arts Review, Winter 2007. The bottom right-hand corner would appear to back up Sotheby's, no?